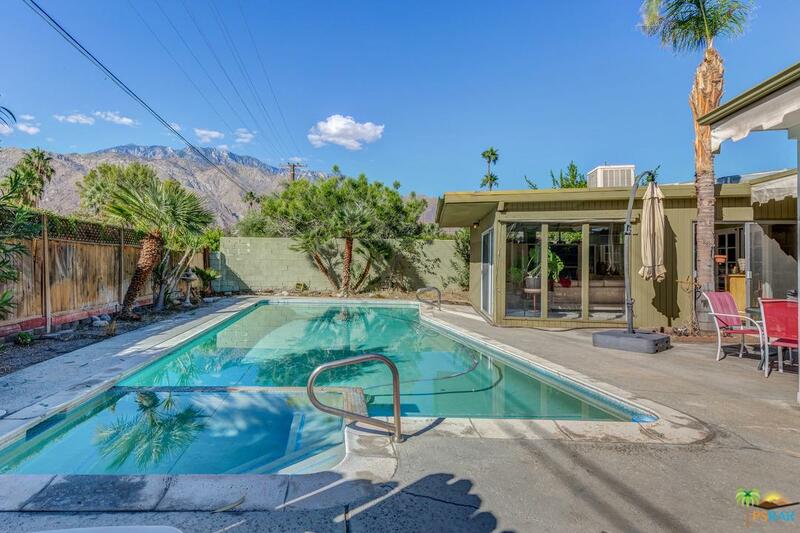 A fabulous mid century buy in central Palm Springs on fee land with a large lot and great mountain views. The living room has a wood burning fireplace and is open to the L shaped dining space. The kitchen has gas cooking, quartz countertops, tile backsplash & refrigerator w/icemaker. The stack washer/dryer is off the kitchen. The master suite has a ceiling fan and bath with a shower stall. A guest room with guest bath off the hall. There is an additional enclosed living space off the living room and overlooking the pool that is bright and perfect for entertaining. Large lot with pool and mature vegetation. Square footage of home taken from the tax record. Buyer to independently verify the square footage. This is an amazing buy!